Opera Holland Park (‘‘OHP’’) is a registered charity (Charity Number 1096273) and is a company limited by guarantee registered in England and Wales (Registration number 4515375). 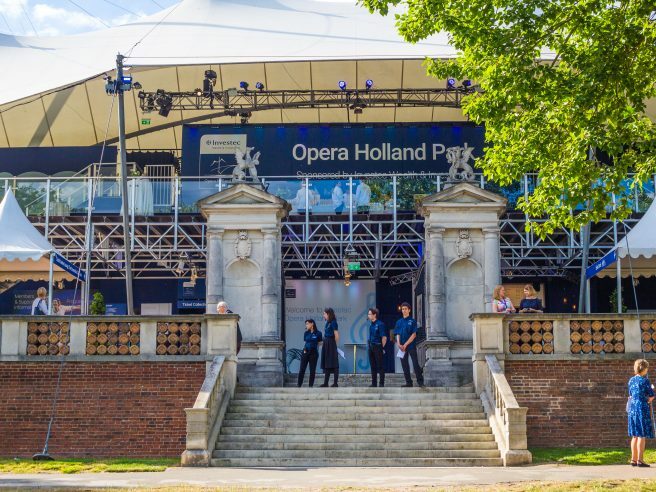 “Event” means an entertainment, opera, concert or any other event held at Opera Holland Park for which we have the right to sell tickets. 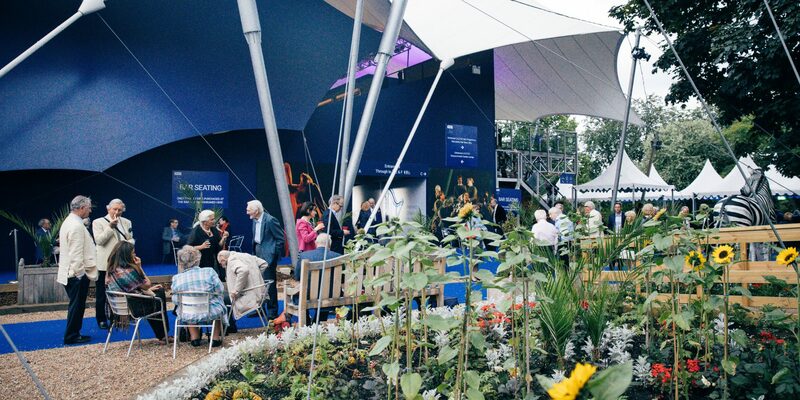 “Tickets” means printed tickets or any other kind of proof of purchase, including electronic tickets sold by us or an authorised producer or promoter giving the purchaser the right of admittance to an Opera Holland Park event. “We” means Opera Holland Park. “Us” and “Our” shall be assumed to represent the same parties. “You” means you or anybody who in our opinion is acting on your behalf. “Group” means group of five or more people attending or gathering together at an event. “Management” means any member of staff designated to act on behalf of the company, stewards (who carry the authority of the Management) and non front of house representatives of the company. All tickets are sold subject to availability and are subject to these terms and conditions. Once read, any issues relating to them should be raised with us before purchase. Purchase of tickets represents acceptance of these terms and conditions. Please note that a booking fee of £3.50 will normally apply to ticket orders unless you are a Member or Supporter. It is your responsibility to check your tickets once received. It may not be possible to rectify mistakes; however they have occurred, after purchase. Please contact us immediately that a mistake is noticed. We do not accept responsibility for any tickets that are lost, stolen, defaced or destroyed. You must notify us of any issues relating to access before booking. Only tickets purchased through the Box Office or approved agents are valid for admission. You must notify us 72 hours before attending if your tickets have not arrived unless you have arranged to collect them at the theatre. We reserve the right to issue duplicates at our discretion. We reserve the right to allocate different seats should this be necessary. We will endeavour to ensure these are of the equivalent value to those purchased. If this is not possible, suitable compensation will be offered. If collecting tickets from the box office, you must attend with the card used to purchase the tickets and order confirmation received. 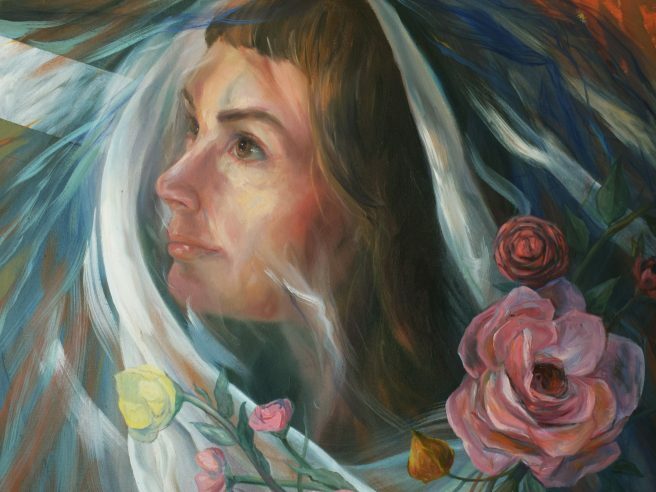 You may not transfer or re-sell a ticket for more than its face value. The number of tickets purchased may be restricted in number. Restrictions will be notified to you at time of purchase and we reserve the right to cancel tickets that are purchased in excess of these restrictions. Print at Home is an alternative way to receive your tickets which allows you to print tickets in advance of the performance and proceed straight to the theatre. Each person must have a valid Print at Home ticket before entry to the auditorium and may be asked for current valid ID. Tickets cannot be refunded. However, subject to availability, tickets may be exchanged. For non-Members, ticket exchanges are at the discretion of the management and are subject to a £6.50 fee per ticket (available until two weeks before the performance). Exchanges are available to Members and Supporters without fees under agreed terms. We may offer refunds or exchanges in the event of cancelled performances. In the event that a performance is cancelled after it has begun (due to circumstances outside our control for example, but not limited to; power failures, extreme weather, medical emergencies, demonstrations and disturbances etc. ), refunds or offers of exchange will only be made at our discretion. We may also make refunds or offers of exchange should any performance materially change. The use of understudies or replacements does not represent a material change. Refunds shall only be made to the person who purchased the tickets and are entirely at our discretion. Refunds will be made in the same method used to purchase the tickets and services. Refunds may be offered in the form of vouchers or credit on your account. Your personal circumstances and arrangements including travel, accommodation etc. that are arranged by you are not our responsibility. You make such arrangements at your own risk. We do not accept any responsibility for any loss, damage or theft of your property unless caused as a result of our negligence or breach of statutory duties. We will not be responsible for any loss or damage of items left in the picnic areas during the performance. Valuables should not be left unattended, and food items should be packed away so as to protect them from the local wildlife. Please consider our neighbours and leave Opera Holland Park quietly. It is your responsibility to establish whether the event for which you have booked has been cancelled or re-scheduled. Should we cancel or re-schedule an event we will make best efforts to inform you and will use the contact details you provided upon booking. We cannot guarantee that you will be informed of cancelled or re-scheduled events. You must inform us as soon as possible of any changes to your personal details and contact information. A valid ticket must be presented in order to gain entry to an event. Opening times may be affected and we do not guarantee to open the theatre at the advertised time nor to begin the performance at the scheduled time. No liability for affected transport arrangements is accepted. Children under seven years of age are not permitted in the theatre unless attending the Schools Matinee or a specific family event. Patrons accompanying children may be asked to leave should children disrupt the performance. For Royal Ballet School it is 3 years old. If it is an external hire the policy lies with them. You must decide if a performance is suitable for any child attending with you upon booking. We shall endeavour to inform you before purchasing, or as soon as possible afterwards, if we feel a performance or production should be age restricted. We accept no responsibility for any effect, injury or offence caused by the attendance of a child at an unsuitable performance. Patrons occupying excessive space with bags or other equipment may be asked to remove it. We regret that we do not have a cloak room. No picnics are permitted in the theatre other than in the designated picnics areas which must be pre-booked. OHP is not obliged to provide tables in specific parts of designated areas. Patrons may not move furniture. It is strictly forbidden to be in picnic areas during the performance. Strictly no additional persons may be added to tables without prior booking. Patrons occupying picnic tables must also hold tickets for the same performance. OHP will not be responsible for picnics purchased from third parties. You may not bring food or wine into the theatre unless for use at a pre booked table. No part of the theatre shall be occupied exclusively by any person or group unless specifically arranged with management. No equipment for any purpose, including tables or chairs shall be brought into the theatre The management reserves the right to open the theatre at a time that is deemed appropriate and safe. Patrons with special access needs are required to inform us at the time of booking. In the event that you book for an area advertised as inaccessible, we reserve the right to refuse admission and are not obliged to provide alternative facilities although we will use our best endeavours to do so. You are responsible for booking appropriate seats for your accessibility needs. Please refer to our seating stand and seek advice at time of booking. The theatre has a raked seating stand. We operate a strict latecomer’s policy. Latecomers will not be permitted until a suitable break in the performance, identified by the theatre management. This may be the interval. Latecomers will be asked to remain in the foyer area and/or public areas deemed acceptable by the management. Surtitles are provided on three screens. Surtitles may not always be visible from all parts of the theatre at all times. We do not guarantee that surtitles will always be in operation. OHP is not responsible for extraneous or ambient noise caused by persons or factors outside of our control. The existence of such noise will not constitute a breach of our obligation to provide you with a performance. The unauthorised use of cameras, audio and video equipment is not permitted. Purchase of a ticket means you consent to filming, photography and sound recording which may include you as a member of the audience and its use in commercial distribution without payment or copyright. Unauthorised recordings may be confiscated and destroyed. We will not be responsible for any loss, theft or damage to confiscated equipment. Animals are not permitted in the theatre with the exception of Assistance dogs. If you are bringing an Assistance dog with you, please let us know at the time of booking. The management reserves the right to conduct security searches and to confiscate any item, which in the reasonable opinion of the management may cause danger or disruption to other members of the audience. Patrons may leave the seating auditorium during a performance but may not be readmitted until a suitable break. This may be the interval or not at all should it be after the interval. You may not stand or sit in any gangways, walkways or stairways. Ticket holders must comply with all health and safety announcements, statutes and venue regulations. We will advise when any special effects, pyrotechnic effects, lighting effects and gunshots, will be used. If you have any specific sensitivities to effects such as strobe lighting or loud bangs, please advise the Front of House Manager when you arrive at the theatre. All children must be accompanied by and remain under the care and control of a responsible adult at all times. School groups must have a minimum ratio of one adult to ten children with at least two adults accompanying any group of children even if the group number is less than ten. If you would like to receive a copy of our Child Protection Policy please contact the Education team. Education ticket holders consent to the photographing and filming of themselves as members of the audience. It is the responsibility of the person in charge of the group to seek consent from parents or guardians in advance of the visit. Should you have reason to complain, you should do so to the relevant duty manager during your visit. If the complaint relates to matters of booking or any other aspect prior to your visit, please telephone the box office on 0300 999 1000 to discuss the matter. You may also email boxoffice@operahollandpark.com. In the event that you cannot resolve the matter, you may take the complaint further by writing to; General Director, Opera Holland Park, 37 Pembroke Road, London W8 6PW. Email info@operahollandpark.com. We shall endeavour to answer all complaints within seven working days but answers may take up to 28 working days. Delay or failure to enforce any of these terms and conditions does not mean we have waived our rights to do so. If it is found by a court that any of these terms and conditions are unenforceable, this shall not prevent the other provisions from continuing to apply. For the purposes of these terms and conditions “Force Majeure” means any cause beyond our control including, without limitation, act of God, war, insurrection, riot, civil disturbances, acts of terrorism, fire, explosion, flood, theft of essential equipment, malicious damage, strike, lock out, weather, third party injunction, national defence requirements, acts or regulations of national or local governments or cancellations due to official periods of mourning as a result of Royal demise. We will not be liable to you for failure to perform any obligation under these terms and conditions to the extent that the failure is caused by Force Majeure. Refunds or vouchers will only be given at Our discretion. We offer three quick and easy methods of booking tickets for our events programme and main season.